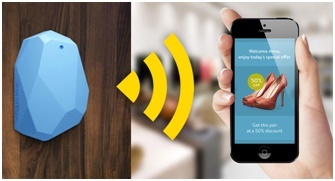 Beacons represent a new paradigm in indoor communication. They have the potential to completely revolutionize the way people behave and interact in indoor spaces. With a myriad of prospective applications that go from in-store marketing to home automation, beacons should create major opportunities for innovation and, consequently, generate significant R&D tax credits. According to the U.S. Environmental Agency, Americans spend an average of 90 percent of their times indoors. In the era of smartphones, the frequent lack of cell signals and difficulties using GPS in indoor spaces are a major shortcoming. However, a new and emerging technology promises to change this scenario. Beacons are low-cost, low-powered transmitters that communicate with smart devices via in-built Bluetooth Low Energy (BLE) technology. When in proximity with such devices, they trigger activity in mobile applications, allowing them to understand their position on a micro-local scale level and to pull specific, context-oriented data from the web, based on location. BLE-enabled beacons have a broadcast range of around 100 meters and are therefore ideal for indoor tracking and awareness. All beacons have a unique identity and offer non-invasive, one-way communication. They require users to download specific apps and agree to the delivery of self-contained packets of data, which are then used by the same apps to trigger actions, such as push messages and prompts. Beacons have the potential to transform the way retailers, event organizers, transit systems, enterprises, and educational institutions interact with people in indoor spaces. Additionally, they can become an integral tool in the Internet of Things ecosystem. Even though potential applications of beacons are multiple, they have been primarily used as marketing and retail tools. 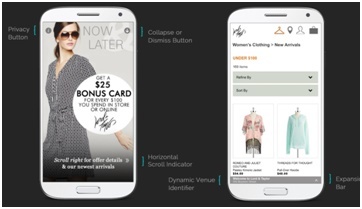 In-store applications include targeted notifications based on the consumer’s location in the shop. These can consist of product details, flash sales or deals, and helpful information. 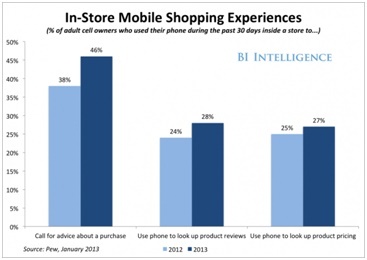 Another aspect of the first wave of in-store beacon applications is offline payments. When integrated with a store’s point-of-sale data, they can speed up the checkout process by enabling hands-free, mobile payments. By saving time and effort this contactless payment system could significantly increase sales. Off-line payments, much like the ones we make on websites can provide retailers with information on consumers’ preferences and allow for follow-ups and recommendations of future purchases. This technology gives in-store transactions the same data sophistication of digital ones, opening the way for Big Data analytics. Recent studies show that nearly half of American consumers already use smartphones when shopping. Common behaviors include looking up product reviews and checking its pricing. Therefore, expectations are that beacons should be easily integrated into the shopping experience and widely accepted. In fact, beacons are expected to have major impact over retailing environments in the near future. A recent study by Deloitte Digital predicts that mobile-influenced on store sales will soon surpass eCommerce, generating an average of $689 billion by 2016. Besides enhancing consumers’ in-store experience, beacons can be used in other contexts, acting as a digital extension of the physical world. Outside stores, the transmitters should become important enablers of the Internet of Things. They can provide relevant information in a wide variety of environments, from museums to airports and ground transportation hubs. Beacons can also be used as tools for home automation. Examples include using the transmitters to turn on lights or HVAC systems and to open doors and window shades once in proximity to predetermined smartphones. Apple has championed the beacon technology with iBeacon, which was introduced as part of iOS7. Offering a new paradigm for indoor communication, it works with a standard format, made out of four levels of information. It is important to note that iBeacon is a technology standard and, therefore, a general term for any device built to these specifications. In other words, it is a trademarked term that refers to the protocols, devices, and uses of BLE. Apple itself has not manufactured physical beacons, which are currently produced by third-party manufacturers. A growing number of companies provide iBeacon hardware and software platforms. Headquartered in New York City, technology startup Estimote has gained prominence as the creator of one of the most popular iBeacon-compatible hardware currently on the market. Estimote has also developed indoor location software used by more than 25 thousand developers around the globe. The company’s most recent creation is the Estimote Sticker, an innovative, super tiny beacon. Working complementarily with traditional beacons, which add a layer of contextual intelligence to static locations, such as stores, the stickers extend that context to objects within those venues. 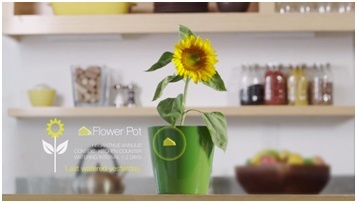 According to the company, Estimote stickers have the power to transform everyday objects into “nearables” - smart, connected objects that broadcast data when in proximity to smart devices. Beacons promise to enable the next generation of mobile advertising and analytics. Companies throughout the country are developing innovative solutions that experience increasing adoption. Based in Chicago, Illinois, GPShopper is a mobile commerce platform for beacon management and reporting. It offers store-layout tools for location-based notifications and a reporting mode that track floor traffic in different sections of the store. Additional store-level analytics capabilities enable access to a large set of location-based data. The company also offers a development kit that allows retailers and brands to integrate GPShopper solutions into existing applications. Forbes recently named GPShopper one of ten companies disrupting their industries through technology. With a growing client portfolio that includes Best Buy, bebe, Express, Grainger, and The North Face, the platform engages tens of millions of shoppers on a monthly basis. Through the delivery of context-oriented messages to distracted and harried customers, GPShopper has successfully targeted and engaged numerous would-be customers, acting as a valuable provider of sales support. Located in Boston, Massachusetts, Swirl also leverages the power of beacon technology to enhance proximity-based indoor marketing. Swirl Ad Exchange is a programmatic solution that allows retailers, brand advertisers, and publishers to digitally engage with and influence in-store shoppers at the precise time and place they are making purchase decisions. Swirl’s technology is used by major companies, such as Lord&Taylor, Hudson’s Bay, Marriott, Alex and Ani, Timberland, Kenneth Cole, etc. The company works in partnership with Motorola Solutions, which provides beacon hardware. The “bring your own beacon” option is also available for retailers willing to integrate third party hardware into the Swirl platform. The New York Times recently pointed out that tens or even hundreds of thousands of beacons have already been installed throughout the country. Locations include outdoor spaces, stores, and even National Football League, and Major League Baseball stadiums. Silicon Valley-based Shopkick was one of the first companies to implement the beacon technology in retail settings. Among its most important clients is Macy’s, which, after a test run at its flagship stores in New York City and San Francisco, announced plans to use the ShopBeacon in all its stores nationwide. The decision is part of an effort to attract more millennial-generation shoppers. Over the next weeks, Macy’s will add 4,000 devices to its 786 locations across the country, in what should be the largest retail rollout of beacons to date. Initial applications should be restricted to digital, storewide coupons that will be delivered to customers’ phones when they enter a store. In the near future, however, beacons will be used to track customer movements, inform about sales items, and deliver recommendations and relevant information to shoppers. Other Shopkick retail clients that should soon adopt the beacon technology include American Eagle Outfitters, Crate and Barrel, JCPenney, Old Navy, The Sports Authority, and Target. 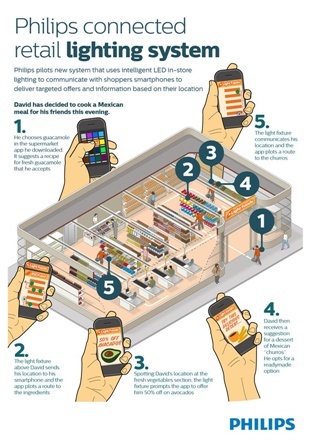 The innovative iBeacon has shed light on major business opportunities. As a result, a growing number of companies are entering this emerging market and offering alternative beacon solutions. This is the case of the PayPal Beacon, a BLE-enabled device that allows for hands-free check-ins and payments. Unveiled in late 2013, PayPal’s technology works in any smartphone, including Android systems. Consumers that have downloaded the PayPal app are automatically checked-in when entering a store equipped with PayPal beacons. The checkout process is also simplified: paying only requires a verbal confirmation. Even though Apple has a similar payment technique, it is limited to its own physical stores. By expanding this convenience to all retailers, PayPal should strengthen its position in the mobile payment market. In April, PayPal began piloting a beacon-enabled payment system linked to Samsung Galaxy smart wearables, such as the Gear 2 smart watch and the Gear Fit fitness band. If successful, this technology will not only make credit cards obsolete, but it will also make smartphones a dispensable element in mobile payment. Another emerging challenger to the iBeacon is Qualcomm’s Gimbal. In addition to providing low-power geofence-based location awareness, Gimbal’s beacons offer additional capabilities that are not included in the iBeacon specification. These include encryption, which makes sure that a store’s beacons are only detected by the same store’s app. Gimbal also offers an Interest Sensing function, which creates inferred lists of users’ interests that can help customize notifications and messages without the need for end-user input. In other words, Qualcomm’s unique solution offers a combination of geo-fencing and analytics that is able to identify user behavior across apps. Gimbal’s beacons have already been deployed in multiple locations, including major sports venues. The Miami Dolphins, for instance, used the technology at their Sun Life Stadium in order to notify fans standing in long concession lines that there were shorter lines a few feet away. In May 2014, Qualcomm decided to spin-off Gimbal, which is now a standalone company, based in San Diego, California. In addition to offering innovative functionalities, iBeacon challengers also combine different technologies. An example is Motorola MPact, a hybrid location-based marketing tool that uses both Wi-Fi and BLE. The combination allows for different levels of detection – Wi-Fi is used for rough location detection while Bluetooth offers a finer pinpointing. Wi-Fi is also used to share information between phones and back-end servers. Motorola’s MPact Platform also provides analytics on customers’ in-store behavior. With a hadoop back-end, it allows for scalable big data crunching. Experts believe that this built-in data muscle can be an advantage in relation to other competitors in the beacon market. The emergence of beacon technology opens the way for major innovation opportunities, which range from novel applications to new beacon-based smart systems. BLE indoor location devices are expanding to unusual environments. An interesting example comes from Dutch digital marketing and technology agency DigitasLBi, which installed 120 beacons in its Boston office. The idea is to identify how and where employees congregate in order to learn how to improve office design and meeting scheduling. This effort sheds light on the possibility of using beacons not only as marketing and information tools but also as promoters of productivity. Improved office spaces can also help companies attract and retain talent, particularly among millenials. The creation of beacon-friendly applications and the incorporation of beacon capabilities into existing applications should also be an important area for innovation. Retailers willing to take advantage of this emerging indoor marketing tool must be able to perform a seamless integration with existing systems in order to favor customer acceptance and facilitate operations. Similarly, the beacon boom should boost demand for analytics software that help leveraging the data collected. Previously inaccessible information about customers’ in-store shopping experiences (such as visits, dwell times, time spent on each section of the store, etc. ), can help create an ultra-personalized, innovative approach to marketing and client relationship. Finally, innovation should lead to the development of beacon-enabled smart systems, particularly for building automation. Beacons can be embedded with sensors that monitor movement, humidity, and temperature, among many other variants. Beacons can also allow for multifunctional systems. With a tradition in lighting innovation, Philips is piloting an intelligent lighting system with built-in beacons. Different from traditional beacons, Philips’ solution works via visual light communications – it transforms the lighting infrastructure into a type of positioning grid, which is then used by smartphones to determine location. Using high rate flickers of LED light that are unnoticeable to the human eye, the system communicates with smartphones’ cameras, enabling data transfer or triggering. Such multifunctional systems eliminate the need for special spots for beacons and provide an enhanced coverage due to the privileged location of lighting units. Recent research shows that 90 percent of retail sales still take place in physical stores. In this scenario, beacons emerge as revolutionary tools for indoor marketing, enabling an enhanced and personalized shopping experience. In spite of their growing popularity among retailers, beacons’ potential applications go far beyond in-store marketing and analytics. BLE-enabled indoor location devices are already expanding into sports venues and other public spaces, as well as into households and commercial buildings. Beacons represent a growing market and a unique opportunity for innovation. Companies investing in such technology should take advantage of federal R&D tax credits.